The Presto 06852 16 Inch Electric Skillet is our best electric skillet, which has sufficient heat control and can help you make fries. It give you an easy cleaning task with its ample 16-inch cooking surface – great if you want to fry chicken. The heat control can be removed to plunge into the dishwasher for easy washing. Our step-up pick is the De’Longhi BG45 1500 Watts Electric Skillet and it gives you a nice tabletop presentation for buffets as an electric skillet with a tempered glass lid. It is great for dinner buffets and has a dishwasher-safe lid that makes it easy to clean for efficient kitchen time. It can help you make a meal for your family and allows for convenient cleaning. The budget pick is the Proctor Silex 38526 Nonstick Electric Skillet and you can cook gravy in it and you can also use it for breakfast meals such as pancakes. With cool touch handles for easy handling, you can simmer any kind of food with this unit. It also allows you to set the desired temperature for the optimum recipe requirements. An electric skillet is a kind of cooking appliance in the kitchen that you can use as an alternative to your stovetop skillet or some other cooking appliance. The electric skillet is like the electric griddle but works on most dinner and lunch items instead of just pancakes and hotdogs. The cooking surface is quite similar but it has an enclosed design in a rounded rectangular shape, much like in a rectangle or square skillet. The purpose of an electric skillet is to provide a super even surface for you to cook your food up. The unique thing about the electric skillet is that you can easily dial in the right temperature that you want your food to cook in as per recipe that you are following. This ensures that your food will taste good, look good and be cooked in just the right way possible. If you want effortless cooking without much hassle in the kitchen or don’t want to use the gas stove at all, you can try the electric skillet or electric frying pan, because it is great at keeping the food so evenly cooked, compared to that of a regular skillet that is heated under a stove, more commonly a gas stove. This is why most people prefer skillets that are electronically heated for a more even cooking surface and the right temperature for your recipe or food item. An electric skillet is also quite similar to the electric griddle, but there are also differences. For instance, pancakes, hotdogs, sausages, eggs and the like are best cooked in the electric griddle while the electric skillet works best when it comes down to potatoes, stir-fry meals, fish, meats, veggies and the like. The electric skillet is not just for cooking evenly and at the right temperature, but it is also great for multitasking. You can cook up so many meals at once with the electric skillet, much like how you cook with an electric griddle. Electric skillets are usually large in the cooking area, allowing you for more space for your bigger meals and family-sized dinners and the like. Electric skillets are not just family dinner friendly – they are also less of a maintenance and less of a hassle to watch over, compared to traditional gas stovetop methods of cooking in the frying pan or even a large traditional oven. The cool thing is that the electric skillet also does not heat up your kitchen and leaves you with more space for your stovetop to make other meals, for when you have a lot of guests coming over. The cool thing about electric skillets is that they allow for slow cooking and simmering for most meals and recipes that require you to do so. You can also make sauces and stews without much problem and braise pork and the like without much of a hassle to watch over. Electric skillets are the best way to perform different jobs and tasks in the kitchen without sacrificing the food quality overall. Contrary to popular belief, breakfast items can also be cooked in an electric skillet. This is because the electric skillet can also act like an electric griddle due to its dual purpose and multipurpose design. Hence, breakfast joys such as pancakes and the like can also be enjoyed with just one kitchen appliance to go cook with. If you’re planning on a lot of meal types and kinds with an electric skillet then you are in luck. Electric skillets are so versatile that you can cook a lot of items there, such as pancakes and fries. Your electric skillet is not just limited to stews and soups but you can also fry stuff like French fries, meats, fish, pancakes and eggs. Size: from 10 1/2 to 16 inches, you can get an electric skillet for your best needs. The size of the electric skillet depends on your preferences and how much will you have to serve in the lunch or dinner table. Most electric skillets are really big in terms of size so you can have more meals in the long run with just one of these kitchen appliances. 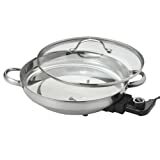 Included glass lid: consider an electric skillet that has a high quality glass lid that has a vent hole for steam and also has a high quality glass that is made not to easily break off with steam and heat. The electric skillet that has a glass lid should also fit perfectly on top of each other so that the food can cook as evenly as possible with the use of the electric skillet. Tempered glass: do consider a electric skillet that has been made with tempered glass as the primary material used in the glass lid that used t cover up the electric skillet. This means that even if it does break, it will not easily scatter into your food so that your food will be safe and sound when you cook it or serve it. Tempered glass is a kind of glass that you will find most on car and auto windows so it is best to get tempered glass for your electric skillet’s lid part. Dishwasher-safe or ease of cleanup: while most and all electric skillets are best washed by the hand due to the nonstick coating, you should also consider one that can also be cleaned in the dishwasher for some of its parts. This ensures that the electric skillet can be easy to clean up, leaving you more time with your family rather than preparing and cleaning up the mess in the kitchen. Portable: if you want to take the electric skillet to your camper, van, RV, mobile home, trailer or any other small space vehicle or area or out in the beach then do consider an electric skillet that is very portable, easy to carry and has high quality handles that will not burn your hands when you carry it. Depth: do consider the depth of the electric skillet as this can be a playing role if you really do want to make soups, stews and anything that has liquid in the electric skillet. This means that the more depth from top to bottom you have for the electric skillet, the more room you have for cooking up stews and bigger heaps of food and bigger batches for large families and the like, much like in a casserole. Thermostat or temperature adjustability: the important thing to consider about the electric skillets out there is that you also get a thermostat that is easily adjustable so not only do you get an even heating experience while cooking with the electric skillet – you also get an adjustable thermostat that will precisely go with your recipe’s preferred temperature based on the cooking results that you desire. Power consumption: from 700 to 1,200 to 1,600 watts for some brands, you can get an electric skillet that best suits your needs. For those who absolutely need a larger electric skillet then you will most likely end up having a high wattage one because it will need a lot of heat generated to cook up the entire electric skillet without leaving any hot or cold pot in its place. Shape: most of these electric skillets are round but some can also be square. It is important that no matter what the shape of the electric skillet is, you should be able to fit it into your space, area or wherever you intend to use the unit on. The common shape is square and rectangle but there are also casserole-type electric skillets out there. Stay-cool handle: since you will need to carry an electric skillet by hand from place to place, you should consider the electric skillet that has a stay-cool handle for easy handling and serving to wherever you want to serve it to, such as on a dinner table for your guests. The handle of this electric skillet should be sturdy enough to handle heat and should not easily break down after long uses. Electrical standards: the voltage system of the electric skillet should be considered, such as 110/120 volts or 220 volts, depending on where you live (U.S. or Europe standards). Choosing the right standards for an electric skillet puts you in safety and eliminates the requirement of a converter. Warranty period and policy: do consider the warranty policy of the electric skillet and what is covered by the warranty, how and where can you get the warranty from and how long will the warranty period last. Our best electric skillet is the Presto 06852 16 Inch Electric Skillet which easily makes casseroles and it has a nonstick surface. It can help you make the best stews and steak at home with its heavy cast aluminum material. It gives you a stick-free cooking and it does not splatter at all when you cook. It is very easy to clean up and it is covered in a non-stick coating. Moreover, it can be a great buffet server and it roasts very well. The skillet is 3 inches deep so it is great for casseroles. You can use it every single day without getting damaged. When entertaining your guests, friends or family members, it is a great skillet to cook with a one pound of bacon or similar foods. With a larger space for cooking, this skillet has a tempered glass cover that protects the food and it saves energy as well to keep your foods cooked evenly and well. The skillet is deep for your soups and stews and to cook large meals. It is great for grills as well and is very useful for many kinds of foods. It is more efficient over a gas range burner or oven as a cooking appliance and can go for up to 400 degrees in its heating process. It also bakes foods and makes the best fried chicken for your needs. It can be easily washed and submerged in water. The non-stick finish won’t get easily damaged due to its durability. You can see what is inside easily with its lid. Great for sautéing, this skillet is also dishwasher safe. The only concern about the Presto 06852 16 Inch Electric Skillet that is not really a deal breaker is that, like with most electric skillets, you may need a larger countertop to fit it in, otherwise it can be a bit too bulky. Our step-up pick is the De’Longhi BG45 1500 Watts Electric Skillet and it is powered with a total of 1500 watts of power. As an electric skillet, it has an extra large surface that is made for large batches of food. It has a non-stick skillet base for easy cleaning and an embedded heating element for even cooking. There are absolutely no overly hot or cold spots with this electric skillet so you can get the best kind of even cooking possible. It gets the job done when you need a family meal and it is made out of a sturdy die cast aluminum body. Great for serving guests, it gives you the shortest cooking time possible. With no heat loss at all, the electric skillet also keeps cooked food warm whenever you need it. There are also adjustable steam vent holes to keep the food fresh and the lid not so hot. It is quite easy to clean and it is great for pancakes as well. The adjustable thermostat is detachable as well. Great for your family dinner table, the 110 to 120 volts rated electric skillet is absolutely great when serving a large crowd due to its presentable design. You can make perfect and juicy steaks in no time with this electric skillet with nice interior and exterior surfaces. With its ideal steam evaporation for your food, the lid fits securely as well so you can cook the best kind of food. You can also make breakfast as well with this electric skillet and its cool touch handles to keep it safe. Moreover, it’s so easy to clean that won’t be cleaning for hours. The Proctor Silex 38526 Nonstick Electric Skillet is our budget pick, which has a nonstick cooking surface and is great for a family-sized meal with up to 1200 watts of power. There are absolutely no hot spots at all and there is also an adjustable heat function for your specific needs. Great for a holiday meal, you can cook your favorite food easily with this electric skillet and its dishwasher safe glass lid. You can sauté your foods and get fresh pancakes every morning even in an RV or camper. It has a good non stick surface and is great for many foods as well. 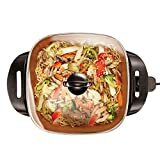 As a covered serving dish for buffets, it has a 144 square inch cooking surface so it is pretty big for your stir-fry needs. It is great to add to your serving table for group parties and you can also be cooking without lifting the lid. Great for lunch or for dinner, you can simmer rice with this electric skillet as well. 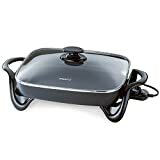 Working well on a buffet, the electric skillet provides an evenly heated surface and it is great for any kind of frying. It keeps your foods ready to cook in no time as a countertop skillet that is made for your cooking needs. It is great for its removable temperature control and it can also braise pork. You can handle the task anytime and fry things with this electric skillet and work up recipes based on your personal preferences. The BELLA 12-inch Electric Skillet with Copper is made with a high quality ceramic copper titanium coating that is nonstick and is made for quick and easy cleaning. As a multi-functional kitchen tool to fry and steam your foods, it is more durable than the competition, giving you a no fuss cooking experience. With its non-stick surface to easily clean it up, it also cooks up to 30% faster than regular skillets out there. The tempered glass lid is dishwasher safe and it can also handle up to 10 chicken drumsticks in just one go with its non-stick coating. You can make quicker meals on the go, roast or bake foods in it. Giving you an easy food release, it has a durable coating and it is great with its coating properties that do not easily give in to the food. The skillet is fully washable under sink water so it is easy to clean. It is also heat resistant up to 850 degrees and it can be easily quickly wiped away for cleaning. Omelets and tomato sauce can be cooked with this skillet that is metal utensil safe as well for sautéing needs. Perfect for family meals and large batches, it offers you a healthy-eco coating for the cooking surface for your ratatouilles and meatballs. Made for every kitchen, it does not contain harmful chemicals so it is eco-friendly and healthy for risottos and the like. It is also PTFE and PFOA free so you can make paellas without the worry of losing your healthier meals. It can accommodate all types of foods and recipes as well. The Black & Decker SK1215BC Electric Skillet has a cooking surface that measures 12 x 15 inches and it is a lot easier to clean than similar skillets. It allows you to cook properly with its durable nonstick coating so you can also clean it up easily afterwards. With a depth of 2 inches, it has a dishwasher safe base. It has a large cooking area and is great for chicken recipes. With a variable temperature control for an accurate recipe following, the serving handles are cool to touch. The tempered glass lid is also very convenient. It also cools off quickly so you can clean it off right away. Browning onions and peppers can be a breeze with this unit that is great for family cooking. It gives you absolutely no cold spots for an even cooking experience. It has a 400 degrees F keep warm setting and it really fits the bill for those who want to save up on kitchen expenses. If you are entertaining guests then this is the skillet to do it with. You can immerse it in water for ease of cleanup and safe cooking for the whole family. With a cool-touch base for serving guests in a buffet style, it is the right size for home meals. Giving you an easy clean up spree, it also heats quickly. The quick-release probe for the temperature makes it a great electric frying pan that can go easily from the kitchen to the dinner table. It is easy for serving and cleaning afterwards. It is great for maintaining a healthy cooking experience in an RV or mobile home, trailer, caravan, trailer truck, camper and the like. Not having to use a lot of pots for cooking large meals or heaps of batches for large families or groups of guests, for an occasion or event is great with this skillet. With the easy to clean up non-stick coated surface, making pancakes is super easy as well. It is perfect for table serving and it has an easy to use dial control. The Rival CKRVSK11 11-Inch Square Electric Skillet has a stylish matte black exterior finish and it is also quite easy to clean. It measures a total of 2 1/2 inches deep and it is great for a room table or buffet. It has a total of 11-inch square cooking surface and it also keeps ingredients and soup neatly contained. Great for your delicious recipe ideas, its non-stick coating makes it easy to clean. The handle gives you a safe and secure transport when cooking your carrots and veggies from the kitchen counter to the table. With its tempered glass lid and cool touch handles, this is a nice skillet to use every single day. It can also cook potato recipes and whatever favorite recipes that you may have. Its stay cool knob makes it easy to carry and it can take up to 4 quarts of food items due to its size. It is great for its non-stick cooking surface and can be used in an RV or camper home. With a steam vent for cooking foods, it is also quite dishwasher safe and it gives you the proper steam release for your food with elegance for its design. It is a handy and convenient skillet and a buffet server at the same time in just one kitchen cookware appliance so you can get even cooking all the time. It has a bunch of stay-cool side handles to prevent accidents as well. The included temperature control probe is adjustable and removable and it also does not burn your hands due to its safety. It has a user manual and it is also easy to clean while being fully immersed in water. The Zojirushi EP-PBC10 Gourmet d’Expert Electric Skillet is great for general sautéing with over 1,300 watts of power. It is 2 1/4 inch deep as a skillet and is ETL listed for safety. As a large cooker that gives you easy food removal, the ceramic surface cooking pan is easy to clean and is multi-functional. With a tempered glass lid for cooking foods thoroughly, the deep dish inner pan is easy to clean and disassembles just fine when not needed. It has stay cool side handles for easy handling as an electric skillet. It measures 10 1/2 inches in diameter in its cooking and grilling area. Many recipes are included in this skillet and it is a durable cooking pan that can take up to 430°F of keep warm function. It is a quick and easy way to cook with a skillet electrically rather than on the stove. Great for stewing in a safe and easy way, it is rated for 120 volts usage. It can also be used for grilling so you can use it for barbecue parties and the like. Its detachable magnetic power cord makes it very portable and easy to clean up afterwards. It is made with a titanium enhanced nonstick coating that does not get easily stained or chipped off. The detachable power cord makes it easy to carry and the adjustable temperature settings also make it great for cooking various recipes. The Hamilton Beach 38528 Deep-Dish Ceramic Skillet is made out of ceramic nonstick coating and is a great countertop skillet to consider in which the heat is adjustable. When you’re entertaining guests this is a great skillet in which the coating won’t crack or peel. Great for dinner needs, it can warm food to 400 degrees F and you get a total of 12 x 15 inches of cooking surface. You can prepare any hearty casserole with a range of cooking options with this skillet. Its lid can go in the dishwasher for easy cleanup. As a deep dish skillet, it is safe to use as it is PTFE and PFOA free. With enough flexibility for various meals in just one dish, this skillet measures 3 inches deep for more soups, stews and the like for a buffet. What’s more, you can be conveniently serving dishes with this skillet as the handles remain cool. You can prepare a variety of recipes with the use of this electric skillet. 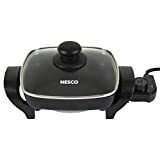 The Nesco ES-08 Electric Skillet 8 Inch is a small electric skillet that is made out of high quality die cast aluminum pan that makes it easy to carry around. It can also make you some stir fries for dinner as well as really delicious casseroles for you or for the family. This electric skillet has a deep interior so you can use it cook up stews and soups and the like. It is also sized for singles so it is very easy to fit on most smaller countertops and others. It is also great in cooking with over 1800 watts of power and it has a nonstick interior to make it easy to clean up. As an 8-inch electric skillet, the unit is great for roasting or frying your favorite food or even a variety of foods. With its stay cool handles to make it easy to handle, you can serve up roasts and steaks with this electric skillet. The temperature control is simple to read and greatly adjustable for your cooking needs. With a sturdy glass lid for covering up your food, the electric skillet is sufficient for dorms, apartments, offices, condo units and at home. It has a safety vent for the steam so you can be making your favorite dishes in a comfortable way even for most RVs and campers. The electric skillet has a nonstick interior that makes it easy to maintain. With a thermostat control for an exact temperature for any meal, it offers an easy cleanup as its lid is dishwasher safe as well. The Aroma Housewares AFP-1600S Gourmet Electric Skillet is made out of stainless steel material and it is a greatly designed classic cookware to have at home. It is great for sautéing a stir fry and it is also ideal for superior results that make you feel like in a restaurant or buffet style catering. With an easy to use temperature control that lets you follow your recipes, it also washes easily for your various food needs. With a large capacity cook area, the electric skillet can serve as a serving dish and it is built to last due to the durability and the elegant design. It has an impact bonded base and is great for cooking and serving. It also has a tempered glass lid that can give your food an even heating. As a great skillet, it can range from 225 to 425 degrees F for its heating to make it versatile for various food recipes and the like. As an electric skillet that makes it ideal for a lot of cooking needs, it also has a removable temperature control for your ease of cleanup and the like. With a high quality 18/10 stainless steel for its durable body, the electric skillet can also present a quick and even heat distribution for you to cook your food as evenly as possible. Other electric skillets that did not make it to our list were not very good at keeping their nonstick coating, which is dangerous. It is important that like a regular skillet or frying pan, the electric skillet should not just have even heating but should also have a high heat resistance against chipping off for the nonstick coating to avoid food contamination in the long run, and as you use it for cooking food. Q: What is an electric skillet? A: An electric skillet, also known as an electric frying pan or electric fry pan, is a kind of frying pan that allows you to cook and heat up food even without the use of a stovetop. It is like an electric stovetop and a frying pan combined in one place and uses electricity to heat up your food. Q: Can you control the temperature of your food in an electric skillet? A: Yes, electric skillets are best known for being able to control the temperature of your currently cooked food. The electric skillet, since it is powered by electricity, allows you to evenly and perfectly heat up and cook food due to its customizable temperature. Q: Why is an electric skillet better than a regular skillet? A: Compared to the regular frying pan an electric frying pan or electric skillet can work best at keeping your food as evenly cooked as possible. It is also great at measuring the exact temperature of your food so you do not have to do some guesswork, making food preparation so easy. Q: How is an electric skillet different from an electric griddle? A: While both of them do look similar and might have the same functions, electric skillets are more for the dinner and lunch tables while electric griddles are more for the breakfast meals such as pancakes and hotdogs. Q: Is an electric skillet usually large? A: Yes, the usual size of an electric skillet is sufficient for more food space and cooking area for you to have. This makes it easier for you to make batches of your favorite food. In the same way, you can cook up a lot of meals at once if you are making anything but it will cook it as even as possible. Q: Does an electric skillet require a lot of attention when cooking? A: Not too much compared to that of a traditional skillet or frying pan and compared to that of an oven. If you are cooking something but you also need to prepare other foods and things in the kitchen or around the house, such as for guests, then the electric skillet simplifies things because it can easily cook up food items with its mostly automatic settings. Q: What cooking methods are ideally used in an electric skillet? A: Braising , making stews, sauces, simmering and slow cooking and the like are just some of the best things that you can do with an electric skillet due to its wide usage. An electric skillet doesn’t always need to be watched over, making it a super convenient way to cook food and then multitask with something else in the kitchen. Q: Can you also do pancakes and breakfast items in electric skillets? A: Yes, the electric skillet is actually meant for nearly all kinds of breakfast items as well and not just lunch or dinner meals. You can make pancakes, hotdogs, sausages and the like. These breakfast items can be prepared on both an electric griddle and an electric skillet. Q: What common foods can I cook in the electric skillet in general? A: The common foods you can cook in an electric skillet are much like what you cook on a regular skillet, such as eggs and meats, but you can also cook more due to it enclosed design and square and flat surface, such as stews, soups and the like. You can also cook fish and potatoes there. Q: What is the average electric consumption of an electric skillet? A: The electric skillet will usually have 700 watts of power but you can have as much as 1,600 watts for bigger and wider electric skillets. It depends on how big your unit is and how much food is placed there. Cooking with an electric skillet can have some impact on your electric bill, since it is electric powered. Ranging from 700 watts to 1,600 watts depending on the size of your electric skillet, you can choose the best option for your family and budget. 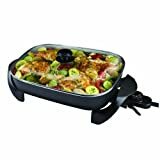 Electric fry pans are usually much more economical, however, when it comes to batch cooking and for large families. Q: What is PFOA and why should I be concerned? A: PFOA or Perfluorooctanoic Acid is a cookware material that is considered not safe for food, and is usually seen in most nonstick cookware. It is used in making PTFE, which is used in most Teflon-based nonstick cookware. Most people regard it as a toxic substance that should not be in cookware in the kitchen to avoid contact with the food that you eat. Q: What is PTFE and why should I be concerned? A: PTFE is also known as Polytetrafluoroethylene and is considered not a good chemical for humans. They are used in nonstick pans for cookware and are mostly found in Teflon. While Teflon takes a lot of high temperature to chip off, you should be wary not to chip it off by not heating your food too much and using wooden utensils. Q: How do I wash an electric skillet and where do I wash it? A: The best way to wash an electric skillet is obviously by hand, since it is a nonstick cooking appliance. Wash as directed by your user’s manual depending on how severely dirty it is. Both the lid and the skillet should be washed carefully so that the nonstick surface will not chip off. Q: What are the kinds of cookware materials out there? A: A kitchen cooking appliance or cookware can be made out of stainless steel, aluminum, ceramic, cast iron or copper. Stainless steel is the most popular option because it will have better protection against rust. Aluminum, however, is a lot lighter to handle. Copper might not work well with most induction heating stovetops. Cast irons are heavy but traditional and organic foodies often love to cook with cast iron anyway. Ceramic as well as stainless steel can be found on electric skillets and other similar cookware. Q: Why should I let the electric skillet cool first? A: Letting it cool down will protect your electric skillet from getting its nonstick coating damaged. The electric skillet should rest for a while and cool down before you clean it up right away so that you do not damage the nonstick coating, which can damage your food, in turn. Q: Are there nonstick cookware that are eco-friendly and healthy? A: There are alternatives in the market today claiming that they are free from harsh chemicals or have nonstick coating that will not have a lot of harsh chemicals in it. Moreover, the nonstick coating of these eco-friendlier products for your kitchen can last longer due to their high heat resistance. Q: Can you cook anything with sauces on an electric skillet? A: Yes, the structure of an electric skillet (or even a regular skillet) makes it also applicable for sauces. Because the electric skillet is very large, you can also sauté and simmer meals that have sauces and the like. This makes the electric skillet very versatile for your needs in the kitchen and for other many purposes. Q: Can you also use an electric skillet for camping? A: Yes, as long as you have an electric source such as in a camper, trailer, RV or mobile home, or even on a portable generator, you can use the electric skillet for camping when you want to prepare dishes without the use of a stove. You can make stir-fry veggies, curries, eggs, steaks and so much more because of the convenience of an electric skillet. What’s more, this electric frying pan is also a lot easier to clean up compared to traditional stovetop cookware in the kitchen that you want to take into the wilderness in a camper. Q: Why is ceramic cookware safe? A: Ceramic cookware is not easy to chip off when it comes to its finish and this is why they are the best when it comes down to high heat cooking up to 700 degrees F. They are also a lot easier to clean up than other cookware and are considered more eco-friendly than others. However, you will need an induction interface if you want to use them in an induction cooking stove. Q: What are the pros and cons of aluminum cookware? A: The aluminum cookware can sometimes be seen on some skillets (although most will still be stainless steel) is that they are easily carried for those who do not like bulky and large cast iron skillets. The only thing is that they are not very good with acidic ingredients like citruses and vegetables. In the long run, the Presto 06852 16 Inch Electric Skillet is our best electric skillet that is great for its 16-inch cooking surface, good and even heat control and variety of recipes to cook with.